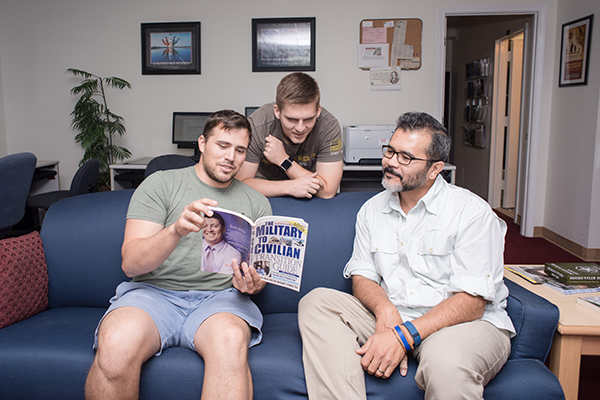 Student veterans talk about the transition from military life to civilian life in UNG's Veterans Resource Center on the Dahlonega Campus. To ensure faculty and staff at the University of North Georgia (UNG) are well-equipped to support and advocate for veterans on campus, the Veteran and Adult Learner Programs (VALP) has conducted Green Zone training, designed to help participants better understand the experience of veterans, military service members and their families. 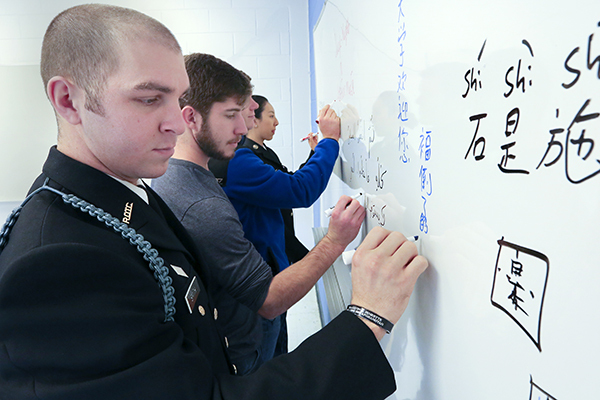 VALP (formerly known as the Center for Adult Learners and Military) recently underwent a name change to better reflect the center's mission and to be more visible for those searching out veteran and military services on UNG campuses. This sticker will denote areas as "Green Zones." "For our student veterans, transitioning into student life is often difficult, particularly for those who have recently returned home from active duty and are still transitioning to civilian life," said Christy Orr, assistant director for student life and director for VALP at UNG. "Unlike the structured environment of the military, universities like UNG have a wide array of schools, departments and administrative areas that can be difficult to navigate. Green Zone training is to assist members of the UNG community in promoting a greater understanding of the challenges student veterans may face as they transition from military to student life." The training also serves to identify individuals who are available to assist the military students and the veteran population, even if only to lend a sympathetic ear and help the student identify and connect with the appropriate resources. "Green Zone training is important for the overall effectiveness of UNG as an academic institution. We have a large number of vets who come to school here," said Andrew Cruz, a UNG senior majoring in psychology and a U.S. Marine Corps Reservist. 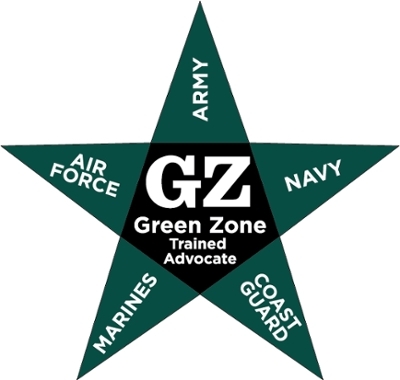 "Green Zone training provides faculty and staff resources and knowledge on how to best receive, help and listen to a veteran who may need their services. If nothing else, it gives the veteran peace of mind to know that an office with the Green Zone Star outside of it is a safe space where he or she can let down their guard a little and be able to converse more comfortably with the staff or faculty member inside." 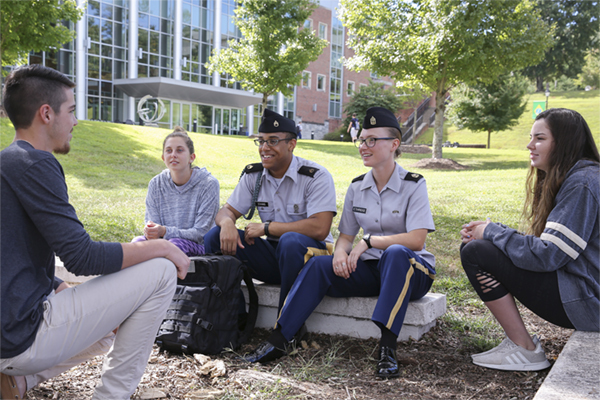 The vision for Green Zone is to develop a highly visible network of faculty and staff across all UNG campuses that military students and student veterans can rely on for assistance. This network can also be a resource to other faculty, staff or students who may have questions about student veteran issues. "This visibility of trained community members helps send a message to the campus that our community cares, which in turn will have a positive effect on the success of military students and student veterans," Orr said. "Our ultimate goal is always to support these students in their academic pursuits." When participants complete the training, they also receive a Green Zone sticker to place on their office door. This helps identify their office as a "Safe Zone" for students when they have questions or are in need of assistance. Orr and UNG were recently honored by Georgia House Resolution 331 for military friendly awards and services provided. The resolution stated that "taking care of our brave veterans and helping them assimilate back into civilian life is one of the most important services our nation can do," and noted Orr as the military liaison for one of the state's "award-winning universities." May is Military Appreciation Month. 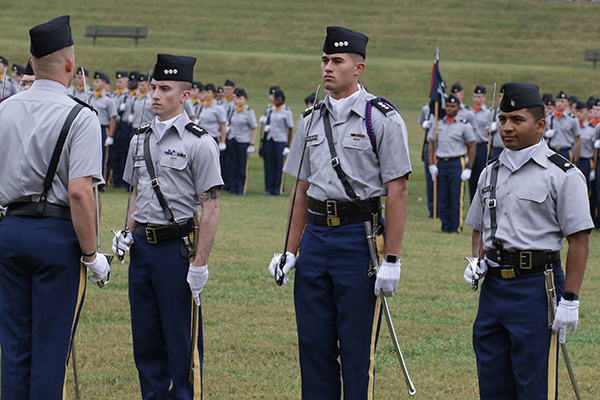 With a Corps of Cadets comprising more than 800 cadets, UNG is one of only six senior military colleges in the nation, and is designated as The Military College of Georgia. The university has a Veterans Resource Center and Student Veterans of America group on the Dahlonega Campus, a Student Veterans of North Georgia group and Military Resource Center on the Gainesville Campus, and the Oconee Campus Veterans Association on the Oconee Campus. Currently, 252 UNG cadets are serving in the Georgia National Guard, and 23 are in the U.S. Army Reserve.